This relaxing place will offer you more than hot coffees and frappes. Their luscious meal choices will satisfy your cravings and roaring appetite. I tried their ‘cafe con pana’ (90 Php) and Clubhouse (130 php) . Though, their crew shared that their Halo-Halo is a must try! :). Lastly, I love the intimate and ardent ambiance of this cafe. For those who are fond of exploring new dishes, this coffee shop will draw you nearer to new way of discovery and exquisite taste through their unique ‘wraps’. Yes, you will definitely go insane if you will try their wraps. Aside from that, they have frappes, meals and hot drinks. If you’re not used to with ‘Indan’ or ‘Thai’ taste, you will find their wraps less appealing; if your taste buds enjoy new twists, you will really enjoy their wraps! I ordered both of their best-sellers, the Paratha seafood wrap with shrimp for 145 Php and ultimate mocha with coffee bits frappe for 140 Php. Their dishes are a little bit pricy, but you will find this cafe uniquely awesome (with their royalty pink sofa which I find so cute— I was not able to take the whole pic though 😦 ). Aside from WiFi connections, they have available books on the shelves— if you don’t wish to indulge yourself in surfing the net. From coffees, meals and cakes, this coffee shop will meet your expectations. With a just pricing, it’s worth every penny. Last but not the least, this sought after place is best known for their meals and desserts. Open from Mondays to Sundays (closes later when weekends, even until 2 am), they have luscious dishes that will surely leave your tummy happy. They have vast choices of meals, sweets and drinks. However, as said by their resident patisserie, when you’re in Demitasse, you should never forget to try their Banoffee pie. It has unexpected twist (they used fresh banana fruit inside instead of that muffin type of filling like the typical cake) whhich makes it aaaaaaaaawweeeesommmmeeee. I totally I agree with him (Did I just forget my name?). Of course, I enjoyed their hot Cappuccino coffee as my perfect pair for the guilt-free dessert. If you want to try heavy meals, try out their heavenly Kare-Kare. If you love Filipino dishes, pastas, sweets and smoothies, Cafe Demitasse will suit you best. 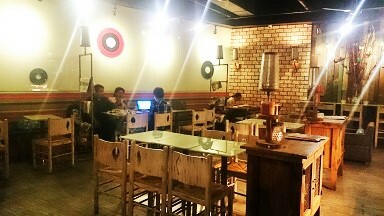 Personally, this place is one of my favorite cafes in Davao City.